Toby has a new trick and it's just about the cutest thing ever. We had a lovely surprise for Thanksgiving this year. At the last minute it was moved to our house! Everyone was super apologetic and worried that they would be putting us out but honestly we were thrilled to host Thanksgiving. We borrowed a couple of card tables and some folding chairs to make our existing table longer. The kids and I gathered leaves and pinecones for decorations and added to them to some gourds I already had to make a pretty centerpiece. I baked an apple pie and everyone else brought delicious dishes from home. It was fun, laid-back, and cozy and I loved every minute of it. Apparently, my family loved it, too because I was told the next day that Thanksgiving could be at our house every year! You know what? That's fine with me! Here's a picture of the table centerpiece. I didn't actually get any pictures of the whole table. Maybe some one else who was there could give me copies of their Thanksgiving pictures. And this is our "Thankfulness Tree." Noah, Analia and I cut out leaf shapes from construction paper and asked people what they were thankful for. Then we wrote their answers on the leaves and hung them on our tree. It was fun to do and made a pretty decoration to boot! The whole day, even the spontenaity of where Thanksgiving was held, will be a cherished memory for me. I really do love living in Newberg and I'm so thankful for a house that can be a home to all our family members. At the end of September Analia and Noah put on a concert for some of our family members. 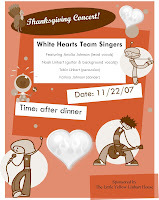 They named themselves "White Hearts Team Singers". (Analia wanted to be "The White Hearts" and Noah wanted "Team Singers" so they just put the names together.) That first concert was hilarious! The kids sang songs they had learned and several originals such as, "Snow is white, but sometimes yellow." We were howling with laughter and singing their songs for days afterwards. When the band decided to reunite for a Thanksgiving Concert I just knew I needed to record it. This time Tobin and Karissa were included in the band (as percussionist and dancer). I'm so happy that my kids will grow up with these memories! You can see the rest of their concert by visiting our Web Album and clicking on the White Hearts Team Singers Thanksgiving Concert folder. Enjoy! My friend Becky (Beckster, Beckaroonie, Beckenheim, Chachi, ChaCha, Cha-cha-meister...etc.) tagged me for a meme. But I'm not gonna do it. Not because I don't like Becky, because I really do, but simply because I have quite a bit more other stuff to write about and I can't afford to be distracted by five random things about myself. However, I will tell you about the moment Geary fell in love with me. It was when we were going to Northridge Community Church. They had just started a singles/college/career/young adult fellowship group (secretly nicknamed "Signals" by a former roommate of mine) and it was meeting in Geary's house. One evening I arrived a little bit late and was quietly trying to make my way over to the couch when I tripped and caused a major distraction. "Sorry, first day with my new feet..." I shrugged and laughed at myself. Geary was completely smitten. So there you have it, ladies. If you want to get a man, just be a total klutz! Let's go back in time, shall we? Click here to go back to August 12, 2007. Last night in the car, Noah was singing a silly song to himself. Geary and I quietly chuckled in the front seat. Noah: What? What's so funny? Noah: What?! Why did you say "nothing" at the same time? Noah: Yes there is! I heard you giggle in your nose! I donated 620 grains of rice with a vocab score of 40. Check it out! Noah: Where ya goin' Lemon Cookie? Jeana: Did you just call me Lemon Cookie? Noah: Yeah. You can call me Snickerdoodle. Noah refuses to be called little. He's a big boy and that's it. It doesn't matter if older kids are bigger, he's still big. And don't even think of calling him otherwise. This morning he couldn't reach the soap in the bathroom. When he called me to ask for help I said, "Oops, I forgot you were too little to reach the soap if I put it in that corner." He stamped his foot and replied, "I'm not little! I'm BIG. It's just that my arms aren't long enough." On Sunday morning I was feeding Toby in bed when Noah came in and said he was hungry. "And I don't want cereal or toast," he announced. I replied, "Well, I can see if we have the right ingredients for waffles. Go get my red cookbook and I'll check." Noah fetched the cookbook and then stared at me with his hands on his hips. "Yes?" I asked. He gave an exasperated sigh and said "Well, you can't cook from bed, ya know!" One day I was walking through the woods with my friends. Peter, Susan, Edmund, Lucy, and Prince Phillip (he's from Sleeping Beauty). Prince Caspian was not able to join us. We were delighted to see a good king lion named Aslan. But there was a bad king lion, too, and he was trying to do awful things to the good king lion. So the bad king lion had to be punished. My friends were delighted to see me bring out my sword and go to battle with this bad king lion. I slayed him and he fell quickly to death. I said, "Wow, you must have been very brave." He replied, "Quite. It was lovely." Did I mention that Geary works at a classical school? Noah can read! One day we were in a toy store when I saw this display of BOB books. I handed the first book to Noah and asked him to read it. There were only 6 letters used in the whole book. A, M, N, O, S, and T. I reminded Noah what each of those letters sounds like and he read the entire book by himself with no help! He was super proud of himself--what a confidence booster! A few days later I saw that our local library carries BOB books. They didn't have set 1 so I checked out set 2. This week Noah has worked his way through all twelve books. He's even been able to read his regular story books and signs we see around town. It's really exciting! I know that reading is much more than just learning phonics, but as an introduction to reading, I really have to recommend these books. We're going to head out to the library now for Story Time and I'm hoping they'll have set 3 for us. "Reader, reader, reader! Noah is a reader!" That's our family song/cheer for whenever Noah finishes a book. I wish you could see his "reader" dance. It's hilarious! We had a blast with the Goddards and I'm looking forward to spending time with them again soon. Tim and Lorraine were supposed to be in Brazil this fall teaching at a school there but Brazil has not given them their visas yet. They have been waiting for months and the fall term is 3 weeks from being finished. You can imagine how frustrating that's been for them. But there is a way you can help! If you or anyone you know needs a website, has a lame looking website, or has a website that is too difficult to keep updated, check out Tim's business website goddardmedia.com. I'm sure they would appreciate a break from "just waiting." 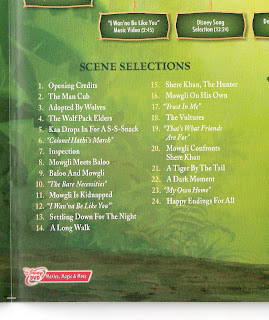 Click picture to enlarge and then check out scene 5 of Disney's Jungle Book DVD. Noah decided he wanted to be a train for Halloween. We found a Thomas costume and James costume but I couldn't see spending $24 on something that he would wear for just one night. So we got creative and made a train smock! It was great because Noah was able to choose whichever engine he wanted to be. He decided on Percy. I drew Percy's image (copied from a DVD cover) and then Noah and used acrylic craft paint to color it in. He already had an engineers cap, handkerchief, and train whistle. We also carved some pumpkins that we picked up from a pumpkin patch in Sherwood. The winking one is mine, the classic jackolantern is Noah's, and the baby is Toby's. Geary was too sick to carve a pumpkin. I haven't blogged in a week! Here's why. Wednesday, Oct 24th--Papa John and Grandma Mary were in town so Anita took her girls and I took my boys to Grandma's house in Albany. We had a fun filled day which included, birthday cake (Grandpa Bob's), airplane flying at the park, playing at Papa Jim's playground, new toys from Frogs and Pollywogs Toy Store, gelato, yummy steak dinner, and cookies. It was so great to visit with family, I didn't want to leave! While I was gone a lady was supposed to come purchase a mirror we are trying to sell on Craigslist. She didn't show up. Thursday, Oct 25th--Tobin had his 6 month well baby visit. It was our first doctor appointment in Oregon and it went really well. Our new doctor is super nice and she has a medical student shadowing her this year so we get to learn all kinds of information that I would never think to ask. Toby got caught up on all his immunizations and then all of us got flu shots. Oh, and Toby was pronounced "right on track" and "socially advanced". Basically, the doctor was charmed by his uber-cute smile. After we left the clinic we went to the farm to spend more time with Anita and the girl who had spent the day with Lila and Eldred. Noah was especially excited to show off Mario, the power-wheels jeep that Lila and Eldred gave him for Noah James Day. * When Noah drove the jeep out of the garage Analia's eyes lit up and she announced, "Noah can drive and I'll sit in the woman-seat where women usually sit unless the men are out working and the woman has to drive the kids around." Yes, I spent a few moments smacking my forehead because of that. Noah drove Analia around the farm and they even ate their dinner (hotdogs) in the jeep while listening to the radio (NPR--we raise them right!). Geary was able to convince Lili and Karissa to try driving and they both did great! It was again really fun to spend time with family. Friday, Oct 26th--John and Mary came up to Newberg to visit Uncle Jim and Aunt Winona. They ended up all coming over to our house for a tour and to visit for awhile. It was a fun visit. Afterwards, we were supposed to meet someone to sell one of our bookcases on Craigslist. They didn't show up. Saturday, Oct 27th--The Craigslist mirror lady didn't show up again. But my mom and my brother came down for a visit. We did a walking tour of Newberg and played at two different playgrounds. Then my mom took us out for some excellent Chinese food. The bookcase people tried again but were late because they got lost and then they tried to lowball me on the price. I was annoyed and told them that I had four other people hoping they wouldn't take the bookcase because they wanted it and would be willing to drive down and get it for full price ASAP. They took the bookcase. Sunday, Oct 28th--My mom and brother headed back to Seattle and we went to Grace Baptist Church for the second time. A retired missionary, Dr. Mary, was speaking and she was amazing! I had actually heard her speak before at Multomah's Mission Conference and it was a joy to hear her again. Later that night we went back to Grace and watched their Worship Flags team. It was so cool! I could easily imagine all of us in a great celebration before the King with these children waving their banners and flags and dancing for Him. It was really fun and I think we could really find a home in this church. I'll keep you updated. Monday, Oct 29th--the Craigslist mirror lady didn't show up again! And I had been waiting to hear from a different Craigslist lady about buying a Yoda costume for Toby. When I finally got in touch with her she said, "Oh, yeah, I meant to tell you that I sold it to a lady from work." Thanks. Thanks so much. I have never encountered so many flakey Craigslist users! Also, Geary got his flu shot this afternoon (insert music of doom here) despite feeling like he might be getting a cold. Tuesday, Oct 30th--Our hot water heater stopped heating water. Geary took a cold shower and asked me to investigate our options but I must have been sleep talking because I don't remember him mentioning it at all. Noah and I carved pumpkins and made Noah's costume all day. It was really fun being creative with him. Geary came home from school feeling sick. Wednesday, Oct 31st--Geary called in sick. Cold+flu shot+cold shower=aches, sore throat, headache, fever. Nice. I called several plumbers and Home Depot to arrange getting the water heater replaced. Even though Home Depot was a little bit more expensive they said they could do it the same day so we went with them. Three hours after setting up the order I hadn't heard from the contractor yet so I called back and learned that their computers had been down all morning and that someone had called in sick and they were way behind and couldn't it make it until between 9 and 11pm. Geary took the phone and said, "We went with you because you said you could do it today." They said, "Yeah, we'll be there tonight." Of course, they called later and said they couldn't make it and offered us $50 off if they could come the next day. I asked, "When will you be here?" They said, "We'll have a contractor on your doorstep at 9am." I said, "I guess that will work." You know where this is going right? Noah called Lila at the farm and asked if she would like to see the costume that he made. She said, "Of course!" so I took the boys over to the farm where Noah proudly showed off his costume. After that I took Noah trick or treating around the neighborhood and then we headed home to pass out candy from our house. It was fun but kind of sad--only about 1 in 10 houses had their lights on. I had really been hoping to meet lots of our new neighbors. Thursday, Nov 1st--9am came and went and no contractor was on my doorstep. At 9:45 someone called and said, "Are you the house with all the mailboxes outside?" I said, "Noooooo? Do you have the right address?" They didn't. But then 10 minutes later Ryan from Fast Water Heater showed up and he's replacing our water heater as I type. He also wins brownie points for letting Noah "help" with his toy tools. Phew! What a week! And Kudo's to you if you read this far! *Noah James Day was a special day at the farm just for Noah this summer. I have a post about it but I need to scan in the pictures. 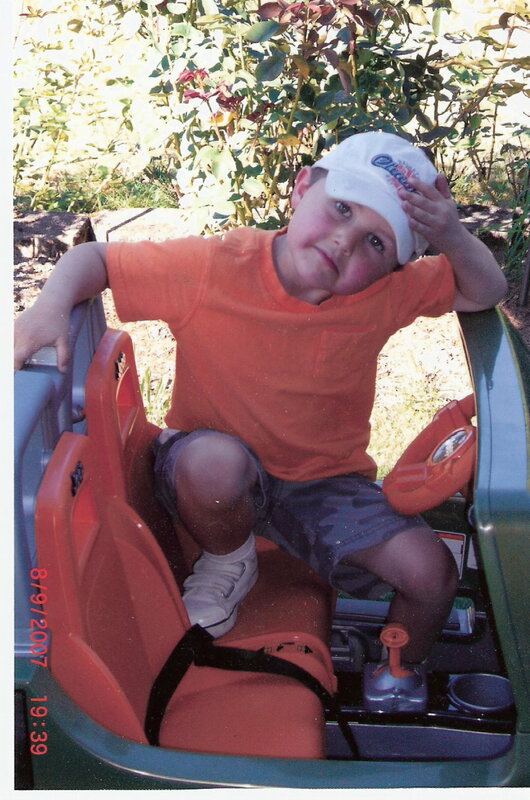 There are some amazingly cute photos of Noah.